Japan Centre and Toku Restaurant have teamed up with the British Film Institute to offer a fantastic competition for a night full of tantalizingly tasty Japanese food and exciting, post-war cinema. Immerse yourself in Japanese culture with a trip to Toku Restaurant, where you can indulge in the finest traditional Japanese food before heading off to see a choice of some of the most vibrant and innovative films ever created. This amazing competition includes a meal for two at Toku Restaurant including wine and entry to any one of the Japanese films being shown at the BFI Southbank throughout August. 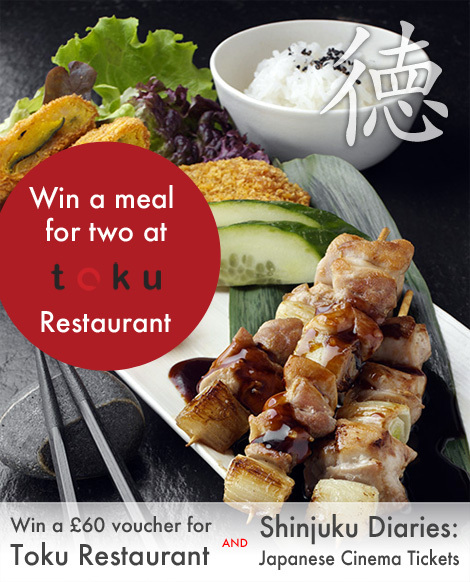 • A voucher for Toku Restaurant for two people up to the value of £60. We will also throw in a free bottle of wine to make the evening even more enjoyable. • Entry to one of the many films being shown at the BFI Southbank during their Shinjuku Diaries Season. Through the whole month of August, they are showing a selection of classic Japanese films from the Art Theatre Guild of Japan. Like all our previous competitions, all you have to do is head over to our Japan Centre Facebook page, become a fan if you aren’t one already and leave a comment on the competition post. We will choose a random winner from everyone who leaves a comment and announce the winner on Friday 5th August. If you swing in social media circles that does it all in 140 characters or less, you can now enter this competition via Twitter. Just Retweet the competition status and you will be entered too. We will choose one winner from all entries from both Facebook and Twitter, so you can choose either way to enter. We will send the winner a message through facebook or a direct message on Twitter on Friday evening so make sure to check your messages over the weeked to see if you have won. We will then send out the Toku Restaurant voucher in the post and you can choose to see any film from the Shinjuku Diaries season at BFI Southbank. Once you have decided which film you wish to see, let us know the date and we can reserve a table at Toku Restaurant for you and arrange the cinema tickets. We promise that you will love our food at Toku Restaurant so enter the competition now and you could be savouring the delights of fresh organic salmon sushi rolls and expertly prepared tempura before you know it! More great Japan Centre competitions coming soon!